England’s Premier League is packed to bursting with some of football’s most-highly prized and highly paid match-winning superstars. Some of the game’s most consistent providers of contest-defining moments and game-deciding goals ply their trade on Premier League pitches – but who among them is the most accurate marksman? A cursory look at the Premier League’s top scorer charts only reveals so much – we’ve chosen to delve a little deeper, beyond those overall goal totals, to determine which of the league’s players rank highest for accuracy and which Premier League players make the most of their chances. Read all of our latest Premier League match previews, predictions, tips and betting offers here. Above we’ve compiled a list of the 10 most prolific shot takers in the Premier League so far this season. Fulham’s Aleksandar Mitrovic is out in front having had a massive 93 attempts on goal for the Cottagers to date in 2018/19. Liverpool’s Mohamed Salah is just behind him with 88, while Wolves’ Raul Jimenez completes the top 3 having taken aim at goal 85 times this season. Interestingly, Mitrovic and Jimenez rank way down in 8th and 9th respectively for their shot accuracy rates in the aforementioned table, hitting the target with just 36.5% and 34.1% of their attempts on goal. Out of the 10 players that rank highest for cumulative shots taken this season, Manchester United’s Paul Pogba has been the league’s most accurate, hitting 43 of his 81 or 53% of his shots on target. Pogba is almost certain to play a key role for United again in their game at Crystal Palace on Wednesday – read our preview of the fixture with predictions and betting tips here. In fact, somewhat remarkably, no Premier League player has had more shots on target this season than the French World Cup winner. In terms of accuracy percentages, Tottenham’s leading scorer and Golden Boot contender Harry Kane follows Pogba having hit the mark with 49.3% of his attempts, with Mohamed Salah running him close with his equivalent figure of 48.8%. Wolves’ midfielder Ruben Neves sneaks onto the list having had 60 attempts on goal this season. His accuracy percentage from those shots of just 18.3% seems desperately low, though 58 of Neves’ 60 attempts came from outside the box. Next, we’ve catalogued the 10 Premier League players who have had the most shots on target this season, in an attempt to discover which players get the most end-product from their efforts. Unsurprisingly, there is a considerable overlap between the total shots list in the section above and the total shots on target list here, though Marcus Rashford, Roberto Firmino and Sadio Mane all make an appearance this time thanks to their impressive accuracy rates. Across Manchester, Rashford’s counterpart at City, Sergio Aguero, stands apart as the most devastating finisher on the list. The Argentinean international is the joint highest scorer in the league this season, and the 30-year old has found the net once for every 1.88 shots on target in 2018/19 for the champions. Liverpool’s Sadio Mane has also been posting some impressive numbers. The Senegalese winger has a goal for every 2.41 attempts on target this season for the title-chasing Reds, while another member from Liverpool’s notorious attacking trio, Mohamed Salah, had scored a goal from every 2.52 shots on target this term. Wolves’ centre forward Raul Jimenez has fired his way onto both of our lists so far, though it’s interesting to note that the Mexican striker has also hit more shots OFF target than any other player in the Premier League this season (39). Away from the Premier League’s premium shot fetishists and goal peppering devotees, there are other players recording noteworthy statistics of their own. 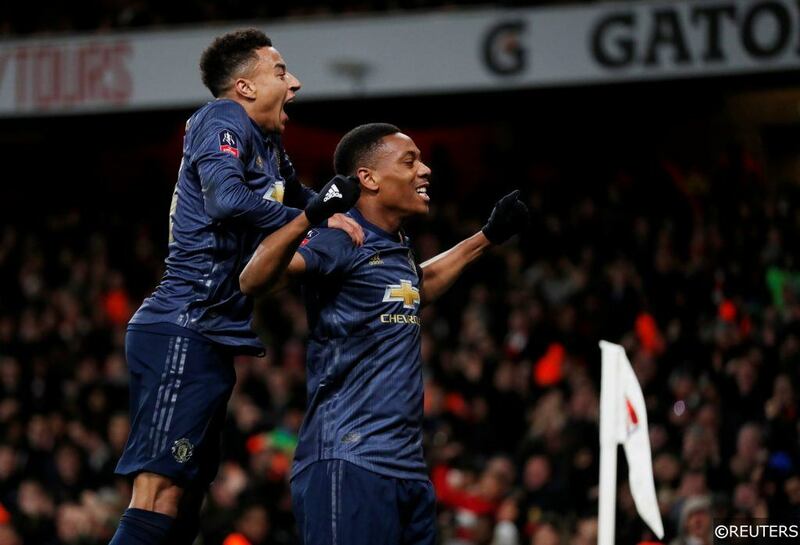 Manchester United’s Anthony Martial has maintained an exceptional accuracy rate with his shooting this season, hitting the target with 60% of his efforts on goal. Martial has been bagging himself a goal for every 2 shots on target he musters for United. Marital has competition in the accuracy stakes from his teammate at United, the often criticised and regularly lampooned Romelu Lukaku. The Belgian international has found his range with 59.4% of his total attempts on goal in 2018/19. Bournemouth’s Joshua King hasn’t hit the target often enough from his attempts for the Cherries this season, but when the Norwegian does manage to get the ball between the posts, his strike hate is excellent. King has scored 9 times from just 17 attempts on target for Bournemouth this season, registering once for every 1.88 of his accurate shots. King is trumped by Brighton bruiser Glenn Murray however. The veteran centre forward featured heavily recently in our article about the Premier League’s dirtiest players, but alongside being one of the division’s worst offenders, Murray is also one of the league’s most clinical chance convertors. Amazingly, Murray has rattled the net for Brighton once for every 1.77 of his shots on target – a figure that gives him the Premier League’s highest conversion rate from accurate attempts on goal. Who knew that beneath that veneer of uncompromising shoulder-barging physicality lurked one of the division’s deadliest finishers? Make sure to check out our regularly updated Premier League Corners & Cards page here with all of our latest card betting tips. Categories: Blog, Football, and Premier League. Tags: EPL, Marcus Rashford, Mohamed Salah, Paul Pogba, Premier League Analysis, Premier League feature, Premier League special, and Sergio Aguero. League: England Premier League. Sports: Football.